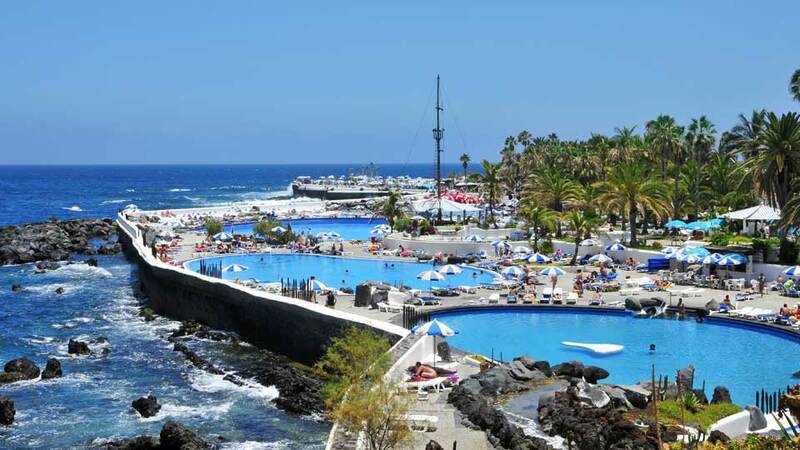 Playa de Martianez is a small-town beach in the vibrant cosmopolitan town of Puerto de la Cruz. This black-sand beach stretches along a promenade, and in the background, large hotel buildings dominate the scene. Situated right next to it is Lago Martianez, one of Tenerife’s most celebrated attractions. This complex of about 100,000 square meters consists of a set of swimming pools, floating islands, cascading waterfalls and beautifully-landscaped gardens. Tall palm trees and umbrellas provide shade, and there are sun loungers to lie on. Rest on a floating island, swim in pools and admire the sea views in this popular park. Lago Martianez is the biggest outdoor Museum of Contemporary Art with swimming pools in Europe. The creative mind behind this architectural work was the well-known Canary Island artist Cesar Manrique. Aside from Manrique, other great artists such as Wilhelm Reich, donated their creativity to build this beautiful place. This blend of leisure and art makes it one of the best waterparks in Tenerife and the world. The charm of this complex attracts thousands of tourists on a regular basis. It was even visited by famous personalities like Winston Churchill, Richard Burton, and The Beatles among others. Lago Martianez is a complex of salt-water bathing pools with floating islands. By day, it’s a chic swimming complex complete with bars and restaurants. At night, the energy rises to a whole new level as visitors flock to its underground casino. Declared a site of cultural interest under the Historic Garden category in 2005, this complex offers fun and excitement for people of all ages. An artificial central lake forms the water park with a set of seven swimming pools: four pools for adults and three for children. The deepest in the complex is around 2 meters while the others have a depth of anywhere from 1.20 to 1.90 meters. Patrolling this vast complex are 3 to 5 attentive lifeguards, depending on the season. Sunbathing areas equipped with sun beds and parasols surround these pools. In the evening, multi-colored lights illuminate the pools. The biggest of the five floating islands also has a spectacular water feature that lights up like an erupting volcano at night. Situated within the complex are a total of 3 restaurants and 9 bars. Cool off with a refreshing drink or have a sumptuous meal by the poolside. Each has their specialties, ensuring that visitors will have the unique experience at every meal or drink stop. From tapas, ice creams to cocktails, Lago Martianez has it all for their well-loved visitors. When the younger crowds have thinned, the waterpark morphs into the entrance to a one-of-a-kind casino. Located underneath the lake, Lago Martianez is the only place in the world to have a casino below sea level. This vibrant casino has two lobbies dedicated to machine gambling and exciting tables. After a fun day out in the sun, visitors can try their luck at a game of blackjack or just enjoy the glamorous ambiance. Lago Martianez is located at a top tourist destination in the north of Tenerife. Hence, visitors will never run out of options when it comes to accommodation. From posh hotels to homely apartment villas, Puerto de la Cruz caters to visitors from all walks of life. Great seafront location, lovely views from the room balcony, attentive and friendly staff. All these await at H10 Tenerife, and more. This 4-star hotel is perfect for couples and families who’d like to have a superb holiday in Tenerife. The hotel features a buffet restaurant with fantastic 180° glass wall for an excellent view of the surroundings. The outdoor pool enclosed with lush gardens is also perfect for a relaxing dip. Right at the doorstep of Lago Martianez is a lovely 4-star hotel. Elegant and sophisticated, the Sol Costa Atlantis Tenerife is a relaxing retreat. Gourmet restaurants, indulging spa facilities and rooms that overlook the ocean await its guests. Staying at Hotel Vallemar is a vacation in itself with its modern amenities and accommodating staff. The outdoor rooftop pool, which boasts splendid views of Lago Martianez, Mount Teide, and the iridescent Atlantic Ocean, is the gem in the crown of this 4-star hotel. Apartamentos RF Bambi is close to some of the main attractions in town. Lago Martianez, the beach, restaurants and shopping district are only a couple of steps away. The location of this hotel makes it an ideal option for visitors looking to stretch out their budgets without having to compromise convenience. Lago Martianez has a fantastic location easily accessible by public transport or private car. 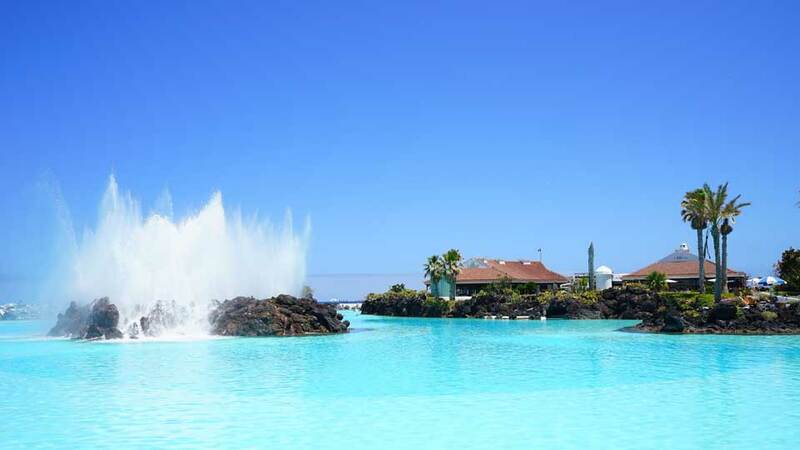 The pools are approximately 20 minutes from the Tenerife North Airport. The area is also teeming with bars, restaurants, cafes and a shopping district. The best option to get to Lago Martianez is by taking public transport. With buses 381 and 382, visitors can stop next to the complex, at Avenida de Colon (stop Plaza Reyes Catolicos). Alternatively, visitors could drive on their own to the complex. However, there is no parking space available at Lago Martianez. Guests may park at Parking El Muelle and just travel by foot for 20 minutes to the complex. Lago Martianez is open from 10:00 to 18:00 from Monday to Sunday, but the complex only admits visitors until 17:00. The basic entrance fee is€5,50 for adults and€2,50 for kids aged 10 and below. Additionally, some hotels in Puerto de la Cruz offers discount vouchers to their guests to cover the entrance fee, mat, and lunch. Apart from that, there are some other special discounts when purchasing more than one ticket. For instance, 15 tickets can be purchased for €60,00 and 30 tickets for €105,00. Visiting Lago Martianez is a must when in the north of Tenerife. With its state of the art facilities, friendly staff and splendid views, it is no wonder why this attraction is the pride of Puerto de la Cruz. Visitors looking to unwind in the salt water complex or sophisticated underground casino will surely indulge in this all-in-one luxury experience.